I may be out of Brak the Barbarian covers to show, but I’ve still got a pretty deep pile of John Jakes books. This curiosity came by way of my colleague Pierce Watters. “John Jakes reads good, like a mystery should.” I love that. 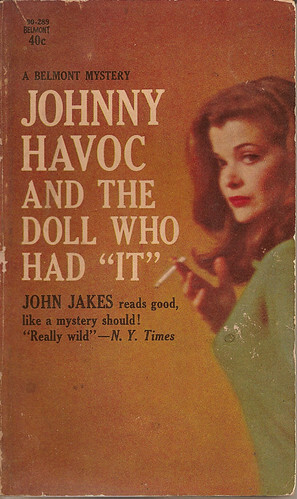 There’s nothing fantastic about the four Johnny Havoc novels unless you count the fact that women would fall all over themselves to sleep with a five-foot-one red head Jakes imagined might be played by Mickey Rooney. This is the third book in the series, and the only one in my collection. I chose it tonight because my girlfriend Danica and I just finished watching the movie Kiss Kiss, Bang Bang, with Val Kilmer and Robert Downey Jr. I thought it was a fun crime drama in the Elmore Leonard school, but the thing that struck me most about the movie was that the action was tied to a series of late-70s crime novels just like this one. They even used Robert McGinnis covers! I’d have posted more of those, but so far I only have one in my collection. For now The Doll Who Had It will have to suffice. Is that actress Jessica Walter on the cover? For some reason the idea of Johnny Havoc and Lucille Bluth getting it on makes me very excited.